A roundup of takeaways from select articles in the current edition of PR News. Influencers are so new to communications and marketing that the term still lacks a clear definition. What’s far clearer is the importance of influencers for marketing and communications. 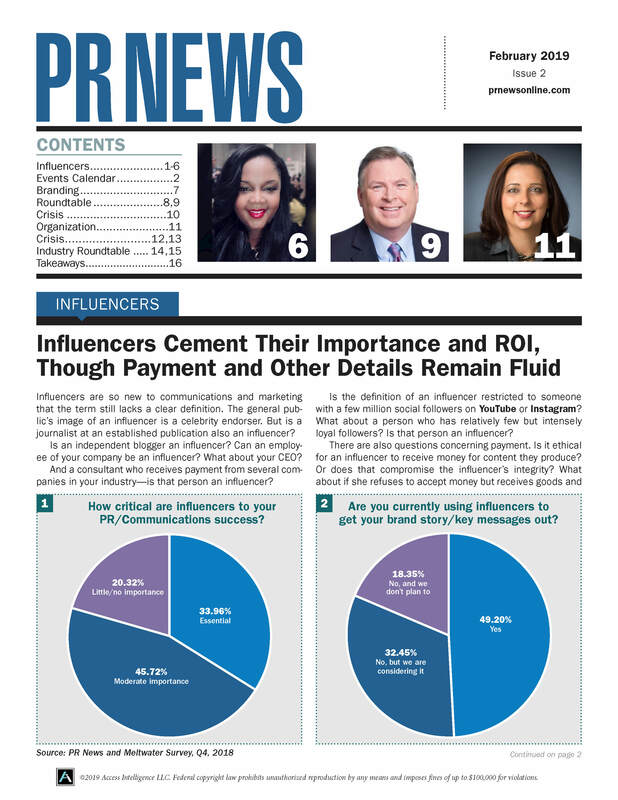 A new PR News-Meltwater survey shows about 50% of communicators are using influencers, and the overwhelming majority are satisfied with the ROI. The maxim for writers is “write what you know.” Jim Lindheim followed that advice. The former Burson-Marsteller chairman has just written “Spin,” a novel with a PR crisis at its center. In this hybrid column, Lindheim offers a glimpse of the novel and provides best practices from years in the crisis-management trenches. Despite the difficulties CEOs and brands experienced in 2018, they emerged victorious in the 2019 Edelman Trust Barometer, released late last month. The public trusts businesses and CEOs most to right the ills of society. “My employer” was the most-trusted entity.